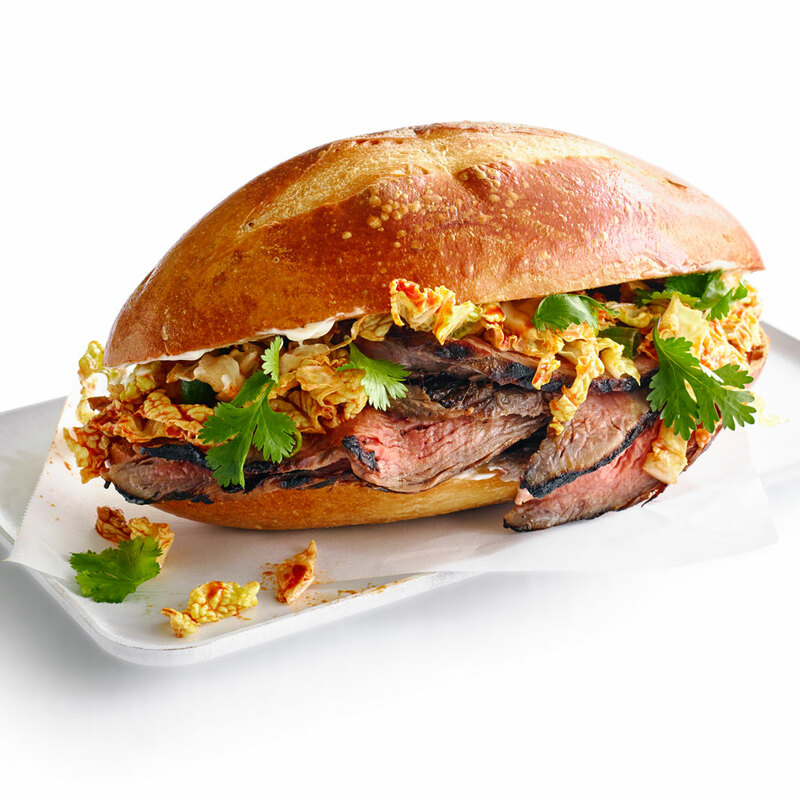 Gochujang, a fermented chili paste essential in Korean cooking, gives these sandwiches lots of pungent, spicy flavor. If you can't find it, substitute with a mix of 1/3 cup white miso, 3 tbsp. Sriracha chili sauce, 1 tbsp. unseasoned rice vinegar, and 1 tsp. regular (Hungarian) paprika. Marinate beef: Combine mirin, soy sauce, 1/3 cup water, the oil, sugar, and garlic in a bowl and stir until sugar dissolves. Pour mixture into a 1-gal. resealable plastic bag. Add steak and marinate, chilled, at least overnight and up to 2 days. Heat a grill to medium (350° to 450°). Make slaw: In a large bowl, whisk chili paste, oil, soy sauce, sugar, and green onions together until sugar dissolves. Add cabbage and toss to mix well. Grill beef (discard marinade), turning once, 6 to 15 minutes total (depending on thickness) for medium-rare. Transfer to a cutting board and let rest 10 minutes. Slice beef across the grain. Spread 1 tbsp. mayonnaise inside each roll. Fill rolls with meat and slaw, and tuck a few cilantro leaves into each.